When favorite Christmas moments are contemplated, most people will, and rightfully so, reminisce about cold winter nights spent snuggled indoors with family, before a fire, sipping tea or hot chocolate, tree lights softly blinking jelly bean colors about the house. Bing Crosby croons, cookies bake, presents already mailed from Aunts afar sit under low hanging branches, tempting you to wait until Christmas morning to open them. But my Christmas memory is different. It involves gangsters and guns and blood and murder. Illegal agreements made on loading docks that can be undone faster than the handshakes that sealed them. It’s about a desperate man at a crossroads in his life. December 2001. I was more than 6 years into my legal career – a Brooklyn-based litigator – a job that made me both sick and depressed, each of those feelings constantly jockeying for position to see which one would eventually do me in. They were, at that time, neck and neck and turning into the home stretch, what felt like the last furlong of my life. And then I got the call. It was a cold, grey afternoon – about 10 days before Christmas. I was in my small office in a small law firm above a small pizza place across from the Adams Street courthouse. The call was from my agents in Los Angeles – they had signed me months earlier, based on a screenplay I had written that had won a New York film festival. It seemed someone had read my script. 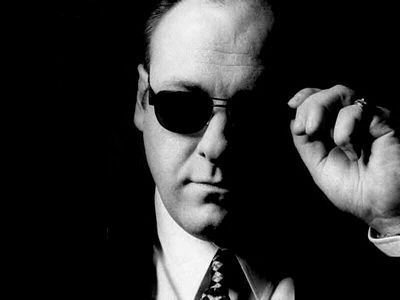 It seemed that someone was David Chase, creator of The Sopranos. It seemed he wanted me to write an episode of his iconic show. It seemed that my life was about to change and never be the same again. Now, as I approach the 10 year anniversary of that phone call, I can’t believe how little I could have predicted when I was reaching for that phone receiver. In the past decade, I’ve moved to LA; made great friends with people I never would have otherwise known; written and produced hundreds of episodes of television, films and novels. I have little children who have never shoveled show and take earthquake packs to school. And I no longer feel like I’m wasting the only go-round God gave me doing something I wasn’t born to do. I no longer feel desperate. So you can have your yule logs and mistletoe. I’ll take .45’s and bootlegged cigarettes. Because those fictional gangsters, and the real-life Mr. Chase, gave me not only my first big break in the business, they gave me the greatest Christmas present I could have ever hoped for. A happy life, doing the only thing I was ever meant to do. As Tony Soprano might say, “It was a f@%*ing Christmas miracle”. Nick Santora was a writer for The Sopranos and Law & Order, writer/co-executive producer of Prison Break, and is currently co-creator, executive-producer, and writer for the hit A&E show Breakout Kings. A born and bred New Yorker, he now lives in Los Angeles, California.